Juice Fasting is an integral part of the Awakened Warrior’s Diet and Nutritional Strategy because of the HUGE benefits it provides to our health, bodies and minds. Not only does it supply your body with the raw, living and nourishing enzymes, vitamins and minerals that it needs to thrive and function at peak physical performance…you’ll also have more energy, clarity of mind and radiating health. BAM!!! 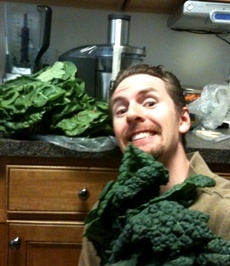 In fact, I believe it is so freakin’ phenomenal that YOU should’ve started juice fasting yesterday!!! However, like many, you may not be sure where or how to begin. And that’s why I want to share some of my best juice fasting tips and strategies with you, including a couple different methods for integrating juicing into your diet. Fast forward to 2009. Now in my early thirties, I was looking for a way to add even more fruits and vegetables to my diet so that I could flood my cells with micronutrients and unleash the power of my ultimate potential! Remembering that the old school bodybuilder, Jack Lalanne was a huge proponent for increasing your fruit and vegetable intake (as well as, juicing in his later years), I sought out to learn more on the topic. I ordered the book “Fresh Vegetable and Fruit Juices” by Dr. Norman W. Walker and began further researching online. Dr. Walker was one of the early pioneers of juicing, first writing and publishing this book in 1936 under the title “Raw Vegetable Juices.” It has been reprinted annually ever since. After reading the book and tons of other articles about the benefits of juicing, I made the decision to buy a juicer from Wally World and give this a serious go. It was my first juicer and nothing fancy or too expensive, just a basic Hamilton Beach Juicer that cost me about $50 bones. I began using it once or twice a week in addition to my regular healthy diet and enjoyed the taste and energy boost derived from the freshly made juices. I especially liked the extra vitamins, minerals and phytochemicals I knew my body was receiving. There was definitely a difference compared to store-bought juices, which are actually devoid of any real nutrients and enzymes due to the pasteurization process. Drinking this freshly made juice is like pouring pure, liquid nourishment down your throat… AND with all of the nutrients in their most highly absorbable and natural forms! So instead of having an artery clogging breakfast that will bog you down…. have 16 ounces of fresh vegetable and fruit juice for breakfast, then eat a sensible lunch and dinner. After your body adapts over the first week, you will be shocked at how much energy, clarity and focus you have. You might even lose a few pounds! That being said, it wasn’t until my brother and I watched an inspiring documentary called “Fat, Sick and Nearly Dead”, that I began experimenting with juice fasting and taking things to the next level. By the way, after you finish reading this post you can watch it for free on Hulu by clicking the image on the left. It’s a great film that shows exactly how the power of juice fasting can help to heal and transform lives. After watching the movie, my brother and I were pumped to try a 7 Day Juice Fast. We’re pretty healthy guys and fairly on the thin side so we decided to limit it to a week to prevent us from withering away to skin and bones! I purchased a new Breville Juice Fountain and stocked up on tons of fresh fruits, vegetables and leafy greens for this “crazy“, yet exciting experiment. Most of our juicing consisted of a 50/50 blend of raw fruits and vegetables, with the exception of a 90% fruit juice blend we made in the evening. We juiced a lot of the same fruits and vegetables I talk about in my post on 72 Superfoods That Will Make YOU Superhuman. The potassium broth was to change it up, give us something warm to drink and supply extra salts and electrolytes potentially lacking in the juice. To make the broth we simply filled a large pot with water and boiled potatoes, celery, onions, carrots, parsley and added some salt and seasoning. We then strained the water, allowed it to cool some and then enjoyed the warm, nutritious broth. Juice Fast Day 1: Woke up and made green juice. 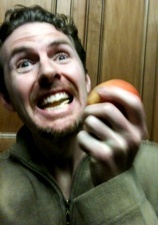 Then bought Breville juicer and $170 worth of fruits and veggies from Earthfare. Pizza at Earthfare smelled really good, bought a Zesty carrot juice drink to have on the way home. Stocked and ready to rock! Juice Fast Day 2: Wrapping up day two. Haven’t really experienced any negative detox effects like headaches or anything, so I guess my diet has been pretty healthy overall. A little hungry but the juice usually satisfies me for a while and tastes good. Juice Fast Day 3: Still alive and going strong. My waist is now 30″. I was having a mild headache tonight, but drank some orange pineapple juice and am now feeling great. Think I’ll take a dip in the hot tub to relax! Yeah buddy. Juice Fast Day 4: Surprisingly felt great today with lots of energy, although after smelling my coworkers Italian food I began questioning why I’m doing this. 😐 I guess this is where my mental toughness will be tested as I continue to defy my instinct to PIG OUT! Drinking a hot potassium broth and it tastes pretty good. Juice Fast Day 5: Okay, getting a lil sick of juice right now, haha. However I felt good today. Hunger is pretty manageable by this point and almost non-existent. Dropped about 5 pounds and my muscles look pretty flat due to depleted glycogen stores. Couple more days to go! Juice Fast Day 6: Had my first ever acupuncture session today. It was pretty fascinating and I feel great! By far this is the best day of the fast. Virtually no hunger today. Just had a 90% fruit drink consisting of strawberries, banana, kiwi, apples, pear, pineapple and carrots. Very tasty! Going to do a hot potassium broth a little bit later. Juice Fast Day 8: Started off the day with juice and then broke the fast with an apple, 2 hard boiled eggs and a few nuts and seeds. My stomach felt a little funny so I read up on how to break a fast . They said to eat only fruits and veggies on the first day. Probably not the best strategy for breaking the fast, so for dinner we simply had kiwi, pineapple and steamed spinach. Juice Fast Day 9: Finished with the juice fast and am slowly incorporating more solid foods back into my diet. This has been both a challenge and an interesting experience. I lost a total of 10 pounds in a weeks time and was surprised at how much energy and mental clarity I had during the fast. 1. 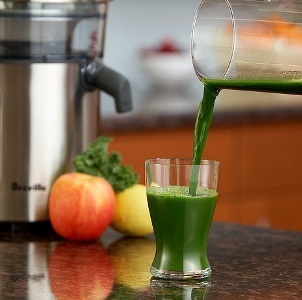 The ideal strategy for fasting and healing the body is to use fresh fruit and vegetables juices. The reason is because raw juices flood the body and cells with easily, assimilated nutrients providing the necessary nourishment, yet without disrupting the fasting process. 2. Juice Fasting allows the body time to rest, heal, eliminate toxins, burn fat, improve insulin sensitivity, optimize your hormones and increase overall vitality and well-being. What this translates to is better health and a better-looking body! 3. Even if you don’t think you can do a full-on juice fast, remember that just supplementing your diet with the addition of freshly made juices is extremely beneficial. If all you ever do is start your day with 20 ounces of fruit and veggie juice, that in and of itself, can go a long way towards maintaining your health. Finally, I’d like to end with our very first Youtube video for this website!!! Since it’s our first video please be gentle with us. We actually recorded this on Day 3 of our 7 Day Juice Fast to show off the new Breville Juice Fountain and how easy it is to get started. DISCLAIMER: Some people should NOT do a juice fast, especially children under 18 years old, pregnant mothers, diabetics, or those with liver, kidney or thyroid diseases. You should consult with your doctor before doing a juice fast, especially if you take any prescription or over-the-counter medications. However, juicing as a supplement to your diet might be an option in these cases. In my opinion, doing a 7 Day Juice Fast is ONLY a temporary strategy for kicking off a fat loss diet, to reset your metabolism, or to help cleanse and heal your body. 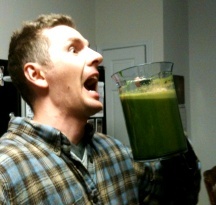 You should return to your ideal healthy diet afterwards… and remember that juicing can be an integral part of that diet! Thanks for the Great article Brandon! Great stuff man! 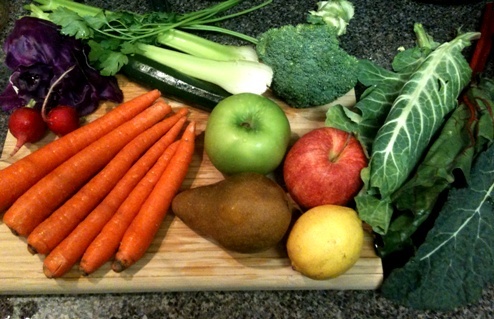 Now, did you juice the same vegetables & fruits in that video everyday for your juice fast? And what portions would you recommend to blend for a meal? Thanks for the kind words about the article. During the juice fast we used a wide variety of produce. So our juices varied throughout the week. During a “typical” seven day juice fast, you will be taking in mostly juice for your nourishment, so it is a good idea to have a wide diversity. While diversity in your produce selection is always important for providing a wide range of vitamins, minerals and phytonutrients, my normal daily juicing doesn’t have as much variation. It can and probably should, however, I tend to juice the same things day in and day out with some slight variation here and there. For example, this morning I juiced my standard concoction of 2 cups of different greens (kale, romaine lettuce, collards, swiss chard, parsley), 3 brussel sprouts, a small chunk of ginger root, 1/4 cup cranberries, 1 stalk celery, 1 carrot, 1 small tomato, 1 kiwi, 1 small apple, 1 cucumber and the juice of a lemon. This made between 25-30 oz of juice or two tall glasses, which I drink for my breakfast 5-6 days a week. I then fast until lunch time around 1pm. I try to eat my meals between 1-8pm (although sometimes this extends an hour or two.) So, basically the method which I am now describing is a type of intermittent juice fasting. Although a little different from a 7 day juice fast, I’ve found this approach to be a more effective way of incorporating fasting into your daily routine. 8pm: lean protein, large portion of carbs like rice, sweet potatoes, etc. Hope this helps to give you an idea of what to juice, how much and how to integrate it into a daily routine. This is just one way…. the main thing is to make it work with your lifestyle, tastes and preferences.